This is a trailer and release details for Moon Child. 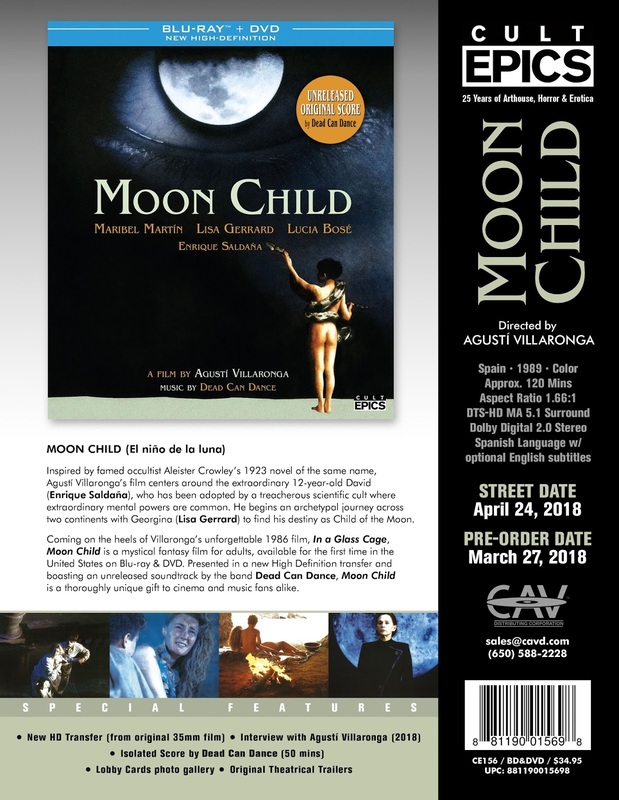 Cult Epics presents Agusti Villaronga’s Moon Child (El Nino de la Luna) featuring an unreleased score by DEAD CAN DANCE on Blu-ray/DVD on April 24, 2018. Cult Epics website MOON CHILD Exclusive: THE MOON Tarot Card featuring Lisa Gerard (Limited edition of 500 with Blu-ray/DVD Combo) Pre-order here. "Inspired by famed occultist Aleister Crowley's 1923 novel of the same name, Agusti Villaronga's film centers around the extraordinary 12-year-old David (Enrique Saldana), who has been adopted by a treacherous scientific cult where extraordinary mental powers are common. He begins an archetypal journey across two continents with Georgina (Lisa Gerrard) to find his destiny as Child of the Moon."